A smart meter is a measurement device that also can transmit meter readings, time-stamped usage data (called interval data) and status information to the utility automatically. MLGW's electric smart meter replaces the previous electric meter, which may have been an older analog meter or a digital meter. Meter manufacturers no longer produce electric analog meters, the traditional equipment with a spinning disk and dials that has been used for decades in the industry. Instead, manufacturers now produce digital meters. Every electric smart meter is a digital meter, but only some digital meters have the built-in features to be smart meters. 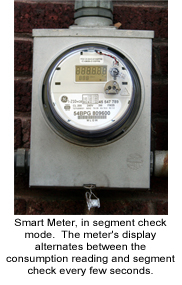 Natural gas and water smart meters include communications modules that send the readings and system alerts to MLGW. 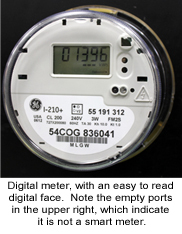 An electric smart meter looks very similar to a digital meter, because it is basically a “souped up” digital meter--but it also has many features that benefit customers and MLGW. 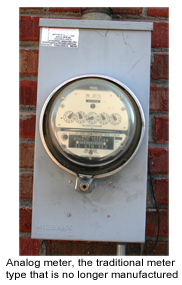 The old meter was read manually, once per billing period, to calculate the customer's MLGW bill. Smart meters records electric information every 15 minutes, while natural gas and water information is recorded in hourly intervals, all communicated to MLGW daily. MLGW imports that information into its billing system and processes it daily to show to customers when they login to My Account so they can track patterns in their electricity, natural gas and water use. Instead of having one piece of information—the bill—customers now have access to weekly, daily, hourly and even 15-minute data to understand their home’s usage and make changes. (86% of our Smart Grid Demonstration participants said they had a better understanding of their home’s electricity use as a result of the smart meter.). The electric smart meter's digital display is easy for customers to read. The display automatically alternates between two modes, changing every few seconds. "Consumption mode" reflects cumulative electricity use since the meter was installed, much like your car’s odometer shows total miles. The meter shows kilowatt-hours (kWh), the standard unit of measure for electricity, which is the same as 1,000 watt-hours.